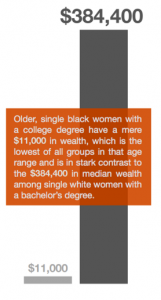 Researchers from Duke University and the Insight Center for Community Economic Development recently released Women, Race and Wealth, the first in a series of briefs that examines patterns of wealth among black and white women. Wealth disparity between black and white households has reached its highest level in over 25 years, and research shows that black women are at an even greater disadvantage. Using the Panel Study of Income Dynamics, researchers analyzed data on both assets and debt and found that black women have significantly less wealth than white women, regardless of age, education level, and marital status.